Something to engage your imagination. 1. The president of the United States, when informed that a second plane had struck the World Trade Center, continued to read about a pet goat. 2. This same president was moved from his high rise hotel in Genoa Italy two months previously for security reasons, because of a known al Qaeda plot for hijacking and "crashing an airliner into the Genoa summit of industrialized nations." The assumption in July 2001 was that there existed a plot that "terrorists would try to crash a plane to kill Bush and other leaders" (LA Times, 9-27-01). 3. The Secret Service did not secure the president, even though his location was publicly disclosed in the press for days before the school photo op on 9/11. This was a break in standard operating procedures that left the president vulnerable in the middle of a purported "attack" on America. And you get 67 more reasons at no extra cost. 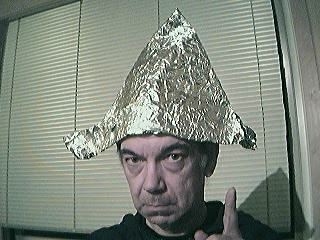 Yes, it calls for a tinfoil hat, but it looks so good on you.